When choosing lashing wire, the numbers make a big difference. Lashing wire is used primarily in the telephone, cable television, and electric power industries to attach conductive aerial cables to support strands. With such specific use, one might think lashing wire is all the same, but because of the different environments it’s used in, different grades of stainless steel are used. Thus, the number differences. Stainless Steel 430 is a workhorse fit for many environments. But lashing wire is very exposed to the elements and so affected by it. The type of metal used can make a difference to the life of wire. For instance, in coastal areas affected by salt and water in the air, the corrosion factor rises. Type 316 has a higher minimum nickel content (10%) plus molybedum, making it more resistant to humidity and salt. It is more expensive than 430, but the price difference is negated by having to re-lash less frequently. Because of the chemical contaminants that become components of the air in industrialized areas, lashing wire faces a tougher fight against corrosion here too. Stainless Steel 316 is up to the challenge; however, a less expensive composition combination can be effective. Stainless Steel 302, with a lower nickel content and no moly, is an effective solution for many industrialized areas. In addition to 430, 316, and 302 Central Wire Industries offers lashing wire in 304, copper, and other alloys to meet customers’ specific needs based on applications, which might not be typical, and locations. Contractors are using lashing wire in more applications, such as construction, and lashing-wire alloys are used in the fabrication of pole line hardware. CWI’s lashing wire can be U.S.-made melt to coil, making it a supplier of choice for government-funded infrastructure projects. CWI experts can help you determine the type of wire that would be best for your location, environment, and needs. Call us or visit https://centralwire.com/lashingwire.php for more information. If you are welding with nickel alloys, your goal is to resist some type of corrosion such as pitting, crevice, and/or stress-corrosion cracking. No post weld treatment is needed to maintain corrosion-resistance when using nickel-based alloys. Nickel alloys have a low thermal conductivity, resist scaling and oxidation at elevated temperatures, and do not harden without special effort and technique. Even when faced with multiple heating and cooling cycles they retain these properties. • Welding nickel is highly susceptible to embrittlement when it comes into contact with sulfur, phosphorus, and lead at elevated temperatures. These contaminants can exist in grease, oil, paint, marking crayons or inks, forming lubricants, cutting fluids, shop dirt, and processing chemicals. The joint to be welded must be well-cleaned before work begins. • During welding, nickel forms a tenacious viscous oxide, which limits the wettability and flow of the weld metal. Adding helium (25% to 50%) to the shielding gas can help wet the puddle. • When using nickel-based consumables, the weld joint must be opened wider to allow for better accessibility. High-nickel alloys are designed to withstand highly corrosive environments most generally associated with high-pressure environments and elevated temperatures. You’ll frequently find them used in oil and gas, aerospace, and power-generating industries for joining and cladding. Nickel alloys with higher percentages of copper, (CuNi-Gen 413 or NiCu-Gen 418, for instance) are often used to fabricate hardware in marine, chemical, and desalination construction. They can be used with most welding processes, and CWI (Central Wire Industries) Welding Generation4 manufactures an assortment of nickel-based and high nickel welding consumables for TIG, MIG, SAW, and SMAW processes. Central Wire UK Limited in Rotherham accepted the International Trade crystal trophy and official scroll signed by Queen Elizabeth on Thursday for being a recipient of the 2018 Queen’s Award for Enterprise. The honor, announced in April, recognizes CWI UK’s impressive, sustained growth in the last three years as an international manufacturer of high-quality stainless steel and nickel-based alloy wire products. The Queen’s Award for Enterprise is the most prestigious business award in the United Kingdom, recognizing the best businesses in the UK and allows winners to showcase the emblem for the next five years. Many of the 57 employees at CWI UK attended the trophy presentation service Thursday. Roper said in April: “The winning of this award gives recognition to all the hard work and commitment given by each of our employees both past and present." Gary Griffiths, a CWI UK employee for over 30 years, accepted the award on behalf of the company. He’s the oldest shop floor serving employee and knows cutting and all the wire drawing processes. It’s his kind of hard work and dedication that has earned CWI UK this award. Thursday’s presentation followed summer celebrations, including a gala dinner and The Queen’s Award Reception at Buckingham Palace in June. Prince Charles represented the palace, and CWI UK Ltd. Managing Director James Roper and CWI President and CEO Paul From were in attendance. CWI UK’s wire drawing and wire rolling operations manufacture round and profile forms in more than 50 different alloys. It also produces welding consumables and slickline products used extensively in the oil and gas industry. With headquarters and facilities in Canada and facilities in the U.S. and the UK, CWI has the widest range of high-performance specialty alloys in nickel, stainless, red metal, and cable products. Numerous industries worldwide, including oil and gas, medical, aerospace, automotive, and marine, use CWI high-quality, certified products. Aircraft cable is the hardest working cable in the world. This wire rope style finds diverse uses in stage rigging, fitness equipment, boat docks, garage doors, bicycle locks, and yes, amazingly, airplanes, particularly aircraft controls. But almost any industry or business can find a use for aircraft cable. If something needs to be held up, this is the go-to wire. Its versatility is the key. Aircraft cable comes in a variety of sizes. Between them, Strand Core and Sanlo Inc., leading manufacturers of wire rope products and cable assemblies, offer cable and strand in 7x19, 7x7, 1x19, and 1x7, and wire rope in 6x19, and 6x37. Sizes range from 0.009" to 5/8”, with more sizes available in the industry. Most commonly offered in galvanized and stainless steels, it’s available in many alloys, increasing its popularity and many uses. Just look at the recent places aircraft cable has been put to work. A snow plow industry leader expanded its sales reach in part because of “virtually indestructible” plow markers made from galvanized aircraft cable. Their spokesperson pointed out that that's the same wire that stops an aircraft on a carrier deck. Heavy-duty machinery and equipment often use aircraft cable in large and small ways. When 20- to 25-foot evergreen trees are moved to a new home, some companies stake each down with rebar posts and aircraft cable to stabilize them while they adjust to their new location. The handle of a popular tool backpack is beefed up by aircraft cable. Because of the potential weight of the bag, the heavily reinforced handle is a strong selling point. When we talk about our music wire string, we aren’t usually talking about aircraft cable, but composer Ashley Fure invented an instrument (right) that creates an eerie profundo moan that is featured in her show The Force of Things: An Opera for Objects. Its primary components: aircraft cable and Styrofoam. Aircraft cable shows up often in architecture, especially when industrial and urban styles are popular. In decorating her own home, interior designer Trisha Isabey created floating shelving on a wall using aircraft cable. In furniture making, a stainless steel aircraft cable suspends a specially designed, configurable indoor pendant made for an innovative lighting company. Functional and beautiful. Aircraft cables also find their way into the auto industry. There’s 90 feet of 12,000-pound aircraft cable wound on the 2017 Ram Power Wagon’s winch’s spindle. Auto reviewer Kelly Taylor said, “It is, arguably, a safer choice for pulling stumps than trying to drive the stump out.” It also comes in handy when moving a shed or pulling out a truck stuck in mud, snow, or a ditch. Aerial adventures and zip lines, like the ones 1,000 feet above the Grand Canyon, are aircraft cable doing stressful work in high-friction environments (because of the winches, pulleys, and harness). And after we’ve risked our lives for recreational thrills, it’s aircraft cable that may have to save our lives. Strand Core General Manager Al Brown points out that the company provides aircraft cable to helicopter rescue hoist manufacturers. Strand Core and Sanlo can provide aircraft cable for your unusual usage, design, or repair. Let our experts guide you to a reliable solution for your situation with high-quality, commercial- or military-grade cable. Contact Donna or Lisa. CWI recently entered the demister manufacturing business—fully. Previously, we had been part of the industry as the provider of specialty alloy wire for other companies that make knitted mesh. Now we’ve acquired state-of-the-art equipment to use our high-quality wire to produce Tech-Mesh™, and from Tech-Mesh we can fabricate our own demisting products. Actually, we can fabricate your unique demister because we have the wire, the equipment, and the knowledge that will allow us to provide you with precisely what you need. This is exciting for Central Wire Industries because it’s an opportunity for us to work closely with the end user of our materials. But wait. We want to work even more closely with the end users, and we have assets to foster that! Specialty alloy knitted mesh mist eliminator to be proud of. Our engineers, metallurgists, and welders stand at the ready to help clients determine what will best serve their needs and fit their equipment. Mick Causgrove, our technical sales pro in Houston, leads the team. Causgrove, is a chemical engineer with more than 10 years’ experience in separations technology. Causgrove speaks excitedly about several aspects of the new Tech-Mesh experience. He relishes asking questions about droplet micron sizes and fan speeds. He wants to know about your process flow, operating conditions, and outlet specifications. He loves to solve the puzzle of combining wire diameters, shapes, and alloys. He’s prepared to make Tech-Mesh into your perfect liquid-from-vapor separator or a gas scrubber, getting you the highest liquid removal rates or efficiency levels possible. Mick Causgrove is ready to demystify demisters. Tech-Mesh can be used in many industries, including oil and gas, food, agriculture, building and construction, aerospace, and mining. CWI makes coalescers for refineries, filtration systems for environmental concerns, and ventilation for HVAC systems, indoor pools, and restaurants. Causgrove is thrilled by the variety; each industry will present its own needs and challenges. It could be pulling the liquids from the air, natural gas, or other vapor streams. “We want to make sure the product is right for you,” says Causgrove. Sometimes a client will come knowing exactly the configuration he wants, with enough information for the CWI team to make a demister. But if given the opportunity to ask customers some questions about their goal, their equipment, and their needs, we can find the perfect product for them. After a series of questions to the client in the know, we can likely provide a better product for him as well. The correct demister pad can potentially increase your profits via their profound efficiency. Causgrove has seen that happen before. One of his success stories involves an air and filtration system that recovers grease for a large food processor. It worked so well – better than expected – that the food processor hugely increased its sales of grease for bio-diesel conversion. It also lessened the amount of grease it released into the environment so much that it no longer paid discharge fees to the city. It’s the kind of good results Causgrove always works to achieve. We’ll find the correct knitted mesh pad for you. When you’re assisting with a project, Causgrove says, “You have to be able to understand the process it will be used for and apply the right solution. That comes with experience.” And sometimes a facility visit to see the situation. But Causgrove is up for that. “If they ask, ‘Can you help me?’ I’m going to say ‘Yes. I can help you resolve your issue.’ It’s a conversation to determine what fits a client’s need. It’s not a form to fill out; it’s me,” he says. “The internet can only help you so much. The Cliff Notes don’t tell the whole story. There’s always something else there; I can help fill in the missing parts to get you to the right application,” Causgrove says. Tech-Mesh can be installed into liquid-liquid coalescers, absorbers, and knock-out drums. It can be a distiller or a separator and extractor of chemicals. With its separation ability, it can extract clean water, and that process can be used to generate clean energy such as biofuels. And for the many agencies, manufacturers, and organizations that need to use U.S.-made products, CWI is the place to turn. Another point of pride for Causgrove and the Tech-Mesh team is that the product is made completely from American materials. CWI incorporates its U.S.-made welding wire, round bar, and knitting wire into Tech-Mesh. It meets Made-in-the-USA requirements or desires. “Let us help you,” he says. He wants that to be the Tech-Mesh motto. Surrounded by high-quality, American-made materials and equipment, with Mick eager to assist, we’re prepared to engineer your perfect coalescers, extractors, distillers, scrubbers, precipitators, or demister pads. Call us at: 800-325-5861. Or contact us via email: techmesh@centralwire.com. PERTH, ONTARIO – August 14, 2018 – Central Wire Industries (CWI) was extremely gratified to learn today that the Department of Finance is contemplating the initiation of a safeguard investigation and the imposition of provisional safeguard measures on a variety of steel products including stainless wire. Since the United States began imposing the Section 232 Tariff on all steel (and stainless steel) imports, the likelihood of offshore product being ‘dumped’ into the Canadian market has risen exponentially; if left unattended, this potential dumping would become reality and would threaten the very existence of many Canadian businesses. CWI has been diligent in its efforts to have stainless wire included in today’s determination and recognize and are thankful for the support it has received from all levels of the Government. Early on, CWI enlisted the support of Mayor John Fenik of Perth who has worked on behalf of CWI with Provincial and Federal Leaders. Scott Reid, M.P. and Randy Hillier, M.P.P. have provided counsel and direction. The Minister of Finance, the Honourable Bill Morneau and his team in Ottawa have taken the time to listen to CWI and have worked actively on our case. Finally, Central Wire Industries offers its gratitude to The Prime Minister of Canada, the Right Honourable Justin Trudeau for his true leadership and guidance as this Tariff issue has continued to take shape and for listening to Canadian business, both large and small. Safeguards remain one of the few hopes Canadian Companies have of ensuring the continuation of a level playing field in the aftermath of the U.S. steel tariffs. As an employer in the small Eastern Ontario community of Perth, it is CWI’s continued hope that progress can be made with respect to the global nature of our business and industry, but specifically, the cross-border relationships between Canada and the USA. Central Wire Industries, founded in 1955 and headquartered in Perth, Ontario, Canada, manufactures and distributes stainless steel, nickel alloy, and copper and brass wire and welding wire products throughout the world. The Company, which maintains twelve manufacturing facilities – one in Canada, one in the United Kingdom and ten in the United States - has over 750 employees. Central Wire provides products to many major industries, including aerospace, petrochemical, food-processing, medical, automotive, and marine. For further information, please contact Paul From, President and CEO Central Wire Industries, at 613-267-3752. Packing TIG filler rods at CWI’s Perth, Canada, plant. Based on experience, CWI chose laser ink printing identification for our TIG wire for Welding Generation 4, bypassing the options of flagging, stamping (or coining), and chemical etching. We then took on the challenge of creating our own laser ink printing machine after determining that our machinists, engineers, and welders could design and build a precision piece of equipment for less than the company could buy one of equal quality. Central Wire Industries is not the only benefactor; laser ink printing offers several advantages to the TIG/GTAW buyers. TIG wire packaged and ready to ship sit in front of CWI’s custom-made laser ink printer. Here are five reasons to choose TIG filler rods with laser ink printed identification. 1. Your wire is unaltered by the printing id process. Stamping minutely alters the shape of the wire, flattening it slightly on the end. Meticulous welders cut off the stamped ends. That’s money on the floor. “Some might call them overly critical,” said Gary Powell, CWI’s global sales manager, welding division, “but they can see the effect of the weld pool when the product has even tiny differences.” An entire Gen4 TIG rod, from tip to tip, can be used by those demanding welders because of the printed ID. And the welders can rest assured we’ve tested the ink, and it will not cause unexpected chemical reactions. 2. Printing allows the producer to meet customers’ customization needs without adding significant time and cost. Laser printing is programmed. Not only can you change it in an instant, you can add to it. The customers may have a need to have more than the required information on their wire; they may want the purchase order or lot ID number. Some may even want to have their company name on it. Printing makes that both possible and easy—because size and space are less of an issue, and it’s a few keystrokes to make the addition. 3. Positive ID is apparent for the entire length of TIG rod. 4. This is a low-cost method of adding the information required by AWS specifications. The AWS specifications regarding GTAW (individual bare filler metal rods) primarily asks that each individual filler rod or electrode be identified. Imprinting ID includes diameter, alloy, and heat number all at a lower production cost. We meet requirements in the most cost-effective manner. 5. Customers get super clean wire—at least from CWI. Our laser imprinting process demands very clean wire so that the ink dries quickly and affixes permanently. To accomplish this, shop dirt, lubricants, and soaps are stripped from the wire, and it’s immediately packaged after printing. By default, the wire you receive is clean. Clean wire nets the highest quality welds. We contend that CWI Welding Generation 4 products make the best welds. Check out all our consumables and feel free to contact us. The quality of every little part of an item increases the reliability of the completed project. Bolts may be among the smallest parts of an airplane, but no traveler wants to hear that low-end or faulty ones were used. Here at Central Wire Industries, we appreciate the importance of the small parts to which we contribute via cold-heading material and bar stock. Different final products need to meet different specifications. We can provide materials for highly specific mil-spec applications that require U.S.-made materials. All our materials will meet your high- quality standards. Having the most recent ISO 9001 and AS9100 certifications help us ensure our quality also equals consistency. This matters from beginning to the end of the formation of a product. The quality and consistency of the steel matter in the quality and consistency of an airplane or car. At CWI our products must pass multiple checks. We also offer special high-quality protective paper and plastic shrink wrap to product your order. Additionally, at any stage in the process, from planning to packing, CWI experts will work with you to create quality designs of products and packaging to fit your exact needs. Reach out to us for quality service and wire. In case you missed it, Central Wire Industries (CWI) is back in the welding consumables business. CWI WELDING Generation 4 offers an innovative and advanced line of specialty alloy welding wire products. Gen4 brings to the welding-wire filler market a long history of manufacturing advanced fine wire. CWI traces its welding roots to Reid-Avery Company, which trademarked its ferrous and non-ferrous welding goods under the name of RACO in 1924. We retain and build on knowledge from our past, a key part of evolving and improving. Our expertise in product development continues with specialization in nickel, stainless, cobalt, and copper welding products suited for many applications. Gen4 products are made for shielded metal arc welding (SMAW), submerged arc welding (SAW), tungsten inert gas welding (TIG) and gas metal arc welding (MIG), to name a few processes. We offer solid continuous MIG welding wires with excellent physical characteristics to allow for easy feed ability. Expect the highest quality stainless, nickel, cobalt, and copper welding wire grades. Many of our customers also appreciate that Welding Generation4, based in Lancaster, S.C., continues CWI’s Made in the USA commitments. When a supplier, producer or distributor needs U.S.-made products, from melt stage to finished assembly to welding, CWI connects it all. CWI provides springs and coils, strands and fasteners, and welding metals made of American-sourced materials and refined and welded in American plants. With our re-emergence on the welding consumables scene, we knew we could be confident in our extreme consistency and highest quality ISO and CWB certified grades. We can provide customers with any diameter need on spools, TIG rods, or in bulk. Our history and past knowledge remain a part of this new generation of CWI welding. Except now we are better. Gen4 welding products and service represent evolution, survival, and strength. This is our evolutionary story as we embrace our welding history and blast toward our future. Need slickline? Slicklines.com—we’ve got it. Click it and come on in to Central Wire Industries’ (CWI) new oil and gas product focused website. Our GD™ - SUPA® slickline is a fabulous product that we’d hate for well service operators to miss out on. This streamlines the search, order, and delivery process. SUPA® and GD™ specialty alloys are well-known and long-standing quality names in oil and gas wireline applications. After acquiring these brands, we’ve used our metallurgical and engineering skills to continue to develop and improve the products. We’re proud to offer continuous weld-free lengths of up to 30,000 ft. (9144 m) that can withstand extremely challenging chemical conditions and heavy loads. Our online Material Guide product selector makes it easy to match a product to your specific well conditions. Understanding the urgency that often exists in drilling and production situations, we want customers to be able to find what they need quickly and easily. So here’s slicklines.com. “This direct product link recognizes that more and more slickline operators all over the world are remote, and they will benefit from direct information from a focused site,” says CWI Commercial Vice President Tom Dodds. Slicklines.com is designed to be customer-friendly. We believe many of our customers, particularly when they are in the field, will find this new site a useful and convenient way to access the best wireline products available today. They can order slickline from their desk, lap, or hand, depending on the device they are using. And with representatives all over the world, CWI can quickly get them what they need, wherever they are, onshore or offshore. The TIG welding wire printer is a highly specialized piece of equipment built from scratch in the Perth, Ontario, plant. It ink-prints identification on the wire instead of stamping or embossing it. LOOKING THROUGH the windows of CWI plants, you can’t see the extent of technology and workmanship embodied by our equipment. Some machines shine, obviously advanced in every way. Others appear well used. But don’t be deceived; they likely click and gleam with high-tech workings inside. Central Wire Industries operations are modern and forward-moving, and our machinery is often remodeled and rebuilt, customized for precision. We have modernized and upgraded numerous wire production lines as well as ancillary treatment equipment over the years. Employees have been given the OK to use their skill and experience to craft what the shops need. CWI often strips an old piece of equipment to the frames and studs and rebuilds a new machine that more accurately meets our customers’ needs than anything on the market. The process combines the operational and maintenance expertise of our machinists and millwrights with advanced software design, such as Solidworks, as well as modern PLC (programmable logic controller) and HMI (human machine interface) upgrades. that could ink print on TIG welding wire. Being able to fabricate our own machines means we do more work in-house, without having to contract portions of jobs out. It means we can build the machinery to fit our floor space instead of buying, selling, or building to create room for equipment. In the end, the products produced, be it profile wire or wire rope, are among the highest quality and most precise available. That’s a huge savings that lowers CWI’s overhead and potentially the price on many products. CWI comes by the ability to build and customize its equipment because of a staff of long-time workers with a storehouse of knowledge and hands-on experience. Employees include engineers, technicians, and metallurgists who work in our in-house QA/QC testing labs to verify accuracy of size, texture, density, pattern, and strength of products and the machines that make them. Our craftsmen, from Europe to North America, are masters of their art and have used their knowledge of drawing and shaping, of heat and pressure, to expertly construct and upgrade much of the company’s highly specialized equipment. When the Union plant began processing larger diameter spring wires that have break loads over 60,000 pounds, the facility was not equipped to handle it. They incurred extra cost and lost time advantages because they had to hire outside labs. But the Union technicians determined how to make it work. They upgraded parts and the display and coordinated with a local company, Cal-Rite, to calibrate the machine. The Union facility can now test sample a maximum break load of 200,000 pounds – on a machine that looks retro. This craftsmanship not only applies to existing equipment but to new equipment requirements as well. When CWI re-introduced Generation4 welding wire to its product line, it designed and manufactured a key piece of TIG wire equipment in-house. The TIG welding wire printer is a highly specialized piece of equipment conceived and built from scratch to ink-print identification on the wire instead of stamping or embossing it. CWI also makes sure our remodeled and rebuilt equipment meets strict safety requirements. “Old machines don’t meet them,” McMullen said. They can become nothing more than dust-collectors if not modified. Often stock machines don’t meet strict ergonomic and safety standards either. Our staff of millwrights, machinists, electricians, and welders, not only repair and maintain equipment, they modify, upgrade, and improve it. At CWI-UK in Rotherham, technicians custom craft the dies for the profile/shape wire. In another show of skill and precision, our in-house technicians service and modify their own drawing dies. A .0120 will never reach .0125 diameter on their watch. Because of their ability to contour dies, they can carve a worn die to another diameter, giving it new life. CWI can produce round and flat wire from 1.00” (25.4mm) down to 0.002" (0.0508mm), smaller than a strand of hair, with unmatched precision. Craftsmanship is appreciated in many fields, from cabinetry to black smithery. Manufacturers of specialty spring and mesh are known for their crafting operations; CWI’s wire-drawing and machinery craftsmanship is akin to any of those with attention detail, quality, and precision. CWI is fortunate to have craftsmen—drafting technicians, engineers, metallurgists, welders, machinists, and more—on our in-house teams, workers skilled with seeing needs, visualizing designs, and making things with their hands. From wire rod coils to assembled parts, CWI connects. Draw-Strand-Assemble is how CWI works with customers to transform an individual component into the finished product. CWI wire and wire related products weave their way throughout high-end applications from 30,000 feet deep to outer space and many places in between. It starts at one of many CWI factories where drawing specialty alloy wires from coils of metal rod, such as stainless steel, nickel, cobalt and copper alloys is CWI’s expertise. Drawing, the metalworking process by which rod or wire is elongated and reduced to a precise diameter, is just the beginning. Depending on the product application, the metal alloy is expertly processed, heated, and surface-treated into an array of fine wire products including bar stock, specialty shape profile wire, and numerous welding wire products. Finished wire is often the starting raw material in the manufacture of other value-added products such as fasteners, mesh, belting, weaves, filters, springs, and screens. The industries served are numerous, and it is safe to say wherever metal equipment is found there is a wire component to be found as well. After drawing, some CWI wire heads to Strand Core, for stranding. Strand Core, CWI’s Florida-based company, winds wire to create numerous cable and wire rope configurations. The cable can also undergo further heat or chemical treatment depending on the final application. Stranded wire is stronger, more flexible and durable than solid—single strand—wire. Hence, cable and wire rope are used to make lifting, supporting, rigging and push/pull mechanisms and assemblies for aerospace, architecture, automotive, marine, medical, theatrical, and oil and gas applications. Strand Core cable connects to Sanlo Inc. in Indiana, especially when Made in America products are needed from melt stage to finished assembly. Sanlo takes various cable products and coats them with vinyl or nylon and/or adds a variety of fittings to make custom engineered mechanical cable assemblies. These assembled products help solve an array of “connection” challenges in automotive, railcar, recreational, safety, and security product applications. CWI, Strand Core and Sanlo products become key components in a vast array of industrial and commercial applications, including fastening, welding, lifting, joining, supporting, heating, cutting, pushing, pulling, dampening, protecting and securing. Ongoing articles and blogs on this site will explore in more detail the connections between CWI products and the final end-uses we see and use every day. Some applications are in plain sight and others are deeply hidden. You’ll be surprised to learn the stages and processes wire goes through to make a product or how it plays a critical component role in a machine or process. Draw-Strand-Assemble: It’s how CWI connects wire to manufacturers in building a better world. Central Wire Industries’ has successfully transitioned each of its facilities to the latest versions of the respective QMS standards, including Sanlo Inc. and Strand Core. CWI maintains two highly recognized quality management system certifications. All our manufacturing facilities are ISO 9001:2015 registered and our CWI-Perris and Strand Core locations also have AS 9100:2016 (D) registration. “As CWI has grown, so has the complexity for managing and maintaining different quality systems at our many locations and businesses,” says V. Jeff Martin, CWI Director of Technology and Quality. We take the necessary steps to be independently registered at all nine of our manufacturing facilities. Potential customers, buyers, and clients look for and expect these certifications. But for CWI the process is not simply to check a compliance box; the structured procedures, documentation, and standards reinforce our meticulous effort around safety, quality, and customer service. In fact, it pushes us to do better, exceeding client expectations. Outside certification registrars check and verify that the plants are meeting the requirements of the various standards. Our many facilities require a variety of assessors; we are certified by BSI in the US and UK, Smithers Quality Assessments, SRI, and Preferred Registrar Group. Those certification checks are periodic, but with the updates in ISO 9001:2015 more closely aligning quality and successful business strategies, CWI sees the benefits of maintaining the standards and adhering to the requirements day in and day out. At CWI we are continuously self-monitoring and performing our own internal audits. We revisit goals and adjust as necessary, working towards continual improvements. We are always examining our processes and considering ways to improve them. We go beyond the certification requirements to most efficiently provide the highest quality and services. CWI is proud to have advanced to the ISO 9100: 2015 and AS9100:2016 (D) standards. They are less rigid in many ways, having a greater focus on performance. They require involvement from top level management down to the factory floors and offices. This leads to focused goals that are clear throughout an organization. The updated ISO 9100:2015 has a new “high level structure” that, through creating commonality, allows easy integration and communication across management systems and among managers. It combines the process approach with risk-based thinking, and it employs the Plan-Do-Check-Act (PDCA) cycle with inclusion of knowledge management principles as well. “CWI uses the PDCA cycle at all levels of the organization –at sales order entry, production planning, contract review, manufacturing, testing, certification, shipping, claims, accounting/finance, and management,” Martin says. It allows the company to serve customers’ individual needs while maintaining industry standards and manufacturing high-quality products and services. The ISO and AS standards help CWI and CWI companies remain on the same page and speak the same language across industries, state lines, and international borders. Central Wire Industries is proud to announce that Central Wire Industries UK Limited has been awarded the 2018 Queen’s Award for Enterprise in the category of International Trade. With facilities in Rotherham, CWI UK Ltd is a leading manufacturer of stainless steel and nickel-based alloy wires. The award recognizes the company’s impressive 92%-plus growth in export sales in the last three years. CWI UK will be able to use the esteemed Queen’s Award emblem for the next five years. James Roper, managing director of CWI UK Ltd, said: "I am absolutely delighted that Central Wire Industries UK Ltd has won the prestigious Queen’s Award for Enterprise. The winning of this award gives recognition to all the hard work and commitment given by each of our employees both past and present." Currently CWI UK employs 57 people. It is part of the Central Wire Industries Ltd group of companies headquartered in Ontario, Canada. CWI has the widest range of high performance specialty alloys in nickel, stainless and red metal, and cable products, which are used in multiple industries worldwide, including oil and gas, medical, aerospace, automotive, and marine. CWI UK’s wire drawing and wire rolling operations manufacture round and profile forms in more than 50 different alloys. Now in its 52nd year, the Queen’s Award for Enterprise is the most prestigious business award in the United Kingdom. CWI UK will receive the award with trophy during a royal reception for Queen’s Award winners at Buckingham Palace this summer. About Central Wire Industries, Ltd.
CWI manufactures and distributes specialty alloy wire and cable products. Headquartered in Perth, Ontario, Canada it has more than 400 employees selling products in more than 50 countries. For more information, visit www.centralwire.com or follow us on LinkedIn and Twitter @CentralWireInd and @CentralWireUK. Central Wire Industries embraces new opportunities and advancements that make us a well-rounded specialty alloy wire supplier meeting the needs of a variety of industries. While we continue to look forward we haven’t forgotten our industrial roots and are proud to have a connection to them with CWI UK, our plant in Rotherham, a stone’s throw from Sheffield. CWI acquired Hempel Wire Industries Rotherham, UK facility in 2015, which added new IP, shaped profile wire, and other products. Sheffield was often called Steel City and was once the undisputed metalworking capital of the world. It has been known for its cutlery production for nearly 800 years, but it became one of the world’s industrial capitals in the 1700s when new techniques were developed there that revolutionized the steel industry. First was the crucible steel process, the first method of casting steel bars, producing a tougher, steel that had consistent, reliable quality. It also could be produced in larger quantities. Benjamin Huntsman’s technique led Sheffield from producing 200 tons of steel a year to 20,000 tons. Soon after Thomas Boulsover, a cutlery maker, created silver plate. He happened upon a temperature for fusing silver and copper and found them compatible for manipulation. This faux silver was obviously cheaper and became popular, allowing the working class to showcase their own silver teapots, candlesticks and cutlery. More than 100 years later Sheffield would again be at the center of a steel-industry revolution when Henry Bessemer perfected a special furnace to super-heat iron and refine the metal to steel. The process lowered the production cost of steel and thus increased an industrializing world’s ability to acquire and use it. Maintaining its reputation as a place for innovation, the formula and process for making stainless steel were developed by Harry Brearley in the steelmaking labs of Sheffield in the early 1900s. Eventually, his persistence paid off. Where other low-carbon chromium-iron alloys didn’t take off, Brearley teamed with his cutlery-making friends to prove what he had immediately thought—this rust-resistant steel would be brilliant for knives. It would eventually find other uses—anywhere that corrosion would be an issue, including power generation, oil and gas, construction and food production industries. Brearley is known as the Father of Modern Metal, and we think of him as our forefather and Sheffield as our ancestral home. From that beginning CWI now produces more than 40 grades of stainless steel wire, used for everything from fine jewelry to aerospace components. Bessemer, Brearley and the others would be proud. It is difficult to imagine that counterfeiters copying patented and trademarked goods from halfway around the world affect your business, employees, and customers, but they do. The theft of intellectual property patents, trademarks, and copyrights creates a negative chain reaction that can include the loss of revenue, jobs, brand integrity and safety. On a global scale, counterfeit products sometimes known as knock-offs cost billions of dollars every year. That estimated cost has grown from $5.5 billion in 1982 to $600 billion presently, a staggering 10,000 percent increase. It’s more than purses and jeans. Knock-offs have crept into the alloy wire industry, which produces critical components of products that affect every aspect of our lives—from medical equipment to bridges, from toasters to cars. The repercussions from using counterfeit metals and wires could be dire. Search the internet: Search for your keywords, taglines, and product identifiers to see what comes up in results besides your company and products. Then you can determine whether any infringement issues are present. Many sites, such as Trademarkia, offer checks for trademarks and intellectual property. Basic searches can provide fast and free information regarding trademark names, logos and symbols, and patent applications. Use DMCA to protect your content. Invest in a monitor: Many companies retain trademark and patent monitoring services, which have proliferated in the digital age. It’s a company’s responsibility to protect its trademark, patents, and copyrights against illegal confiscation, infringement, and misuse. Monitoring companies will do your internet searches for you, watch patent applications and trademark requests, and alert you to potential issues. Use non-disclosure agreements: Also known as confidentiality agreements, non-disclosure agreements outline confidential material, knowledge or information that is shared between two or more parties. “Make sure your employment agreements, licenses, sales contracts and technology transfer agreements all protect your intellectual property too, right from the get-go.” (SOURCE: https://www.inc.com/kelly-fitzsimmons/ten-ways-to-protect-your-intellectual-property.html). Use smart contracts: These logic-based computer algorithms are designed to exchange goods or services using money, property or shares without the complex interactions of a middleman. It’s contract by computer code. Smart contracts are black and white and leave open few windows of opportunity for misinterpretation or fraud. Join organizations: Groups such as the International AntiCounterfeiting Coalition Inc. combat the escalation in IP fraud around the globe. The IACC in conjunction with credit card and financial services companies established RogueBlock in 2012 to detect and squash counterfeit fraud. RogueBlock’s tentacles have reached and destroyed more than 5,000 counterfeiting merchant accounts operating via more than 200,000 websites. Another force of unprecedented success is IACC MarketSafe, which was launched in 2014 to eliminate listings of counterfeits. It has resulted in a “100% takedown rate on listings when companies stand behind their claims,” the company reports. Approximately 6,800 sellers’ storefronts have shut down and been permanently banned, and 200,000 product listings have been removed from the internet. While business-to-consumer (B2C) fraud protection typically gets all the press, business-to-business (B2B) and industrial supply chain fraud can be just as extensive. Industrial suppliers need to use the same safeguards as B2C. With unscrupulous counterfeiters tempting and deceiving companies with lower prices, how can you protect your process, employees and reputation? And perhaps more importantly, how do you protect the safety of your products and avoid the possible dire consequences of having a device or piece of equipment fail because of inferior metal “knock-offs”? As a business buying goods, you can also take extra precautions against counterfeit materials. Search government IP databases. In a digital world, copying and pasting trademarked names and logos into documentation is easy, and even support documentation such as raw material certifications can be misleading or falsified. Buyers need to do their homework and understand where and how the products they are buying are produced; going directly to the originator or holder of the trademark will expediate this. Many countries have government trademark databases wherein the holder and interested parties such as distributors can be verified. Verify certification: Does the product meet industry testing standards? Legitimate metal producers such as CWI (Central Wire Industries) employ mature quality management systems, backed by quality certifications such as ISO: 9001 and AS9100C. The testing process leading up to certification ensures that the quality of products meets or surpasses the industry standard. Supply chains of raw materials are vetted and checked, including independent third-party laboratory testing. Buyers of trademarked or patented products need to check with the original IP holders to see whether the product they are purchasing comes from the proper manufacturer, a licensed producer or an authorized distributor or agent. Counterfeiters and their fraudulent products can be catastrophic to many parties and undoubtedly to a company’s reputation. A little bit of time spent researching the legitimacy of your suppliers, their product origins and quality standards is well worth the effort in helping to combat trademark and IP fraud. Also, it can ensure the safety of your workers and others and preserve the good standing and trustworthiness of your company within your industry. This is the second blog on trademark counterfeiting. Read “Copycats and costly catastrophes: A dangerous supply chain game” for more information. Stealing intellectual property (IP) or using counterfeit branded products, whether it’s a designer purse or a special metal alloy, can result in devastating consequences to the end user. Companies spend considerable effort, time, and money in creating new products for customer benefit. This intellectual property is often patented and/or trademarked. The latter action is undertaken to create brand names for customers to readily identify the products they want and need. A trademarked product acts as a type of insurance, but buyers need to do their homework to ensure that they are getting what they paid for and are not using an inferior and potentially dangerous “knock-off”. Counterfeits and knock-offs are a multi-billion dollar a year industry that has grown from a vendor selling goods out of the back of his truck to the vast globalized supply chain that has descended upon us in the last 25 years, and has unwittingly provided an infinite number of enticing illegal opportunities for counterfeiters to embrace. So why is incorporating counterfeit metals into your production process or end use playing a dangerous game? Knock-offs have crept into the alloy wire industry which produces critical components utilized in the medical, aerospace, oil & gas, appliance, electronics, mining, automotive and a host of other industries, touching every aspect of our lives. In fact, the majority of the goods we consume on a daily basis carry some elements of metal, from the smart phones buzzing in our pockets to the intricate leading edge medical wire MIT researchers have used to develop an implantable device that recognizes which drugs are compatible for eradicating cancerous tumors. In this precarious situation, using a “knock-off” metal could result in dire consequences, and possibly even death for an individual already struggling to survive. Industrial infrastructure that we depend on in our daily lifestyles is often tied to proper use of trademarked materials and the benefits they incur to the end users. The creation of industry standards for commercial materials, such as the Unified Numbering System (UNS) for metals and alloys to systematically designate them by composition, “does not guarantee any performance specifications or exact composition with impurity limits.” Quality and performance variances exist from supplier to supplier within any given alloy, despite the classification system used to identify and source them. Leading manufacturers of metals and metal products, like Central Wire Industries (CWI) employ process trade secrets to ensure quality, tight tolerances and/or discernable special properties of final product grades. CWI goes to great lengths to ensure the integrity and quality of raw materials in their supply chain, especially when the final product carries a globally recognizable trademark or brand name like GDTM and SUPAâ used in oil and gas wireline and slickline applications. Many end users test and approve these products and include the trademarked brand names in their final purchase specification and such is the case for several grades of the GDTM and SUPAâ family of products. Only CWI plants are authorized to make these trademarked products and select distributors and agents then act as resellers around the world to ensure stock availability and on-time delivery. Specialty alloy slicklines are designed to perform in very harsh and corrosive conditions, and with varying degrees of mechanical stress in wells. Oil and gas wells around the world are being drilled to almost unthinkable depths, with the deepest well completed by Exxon Nefegus in 2012 measuring an astounding 12,376 meters (40,604 ft.) The strength, quality, and reliability of metals required to withstand the severe operating pressures, temperatures, loads and chemical environments at these depths is crucial in order to avoid catastrophic events such as failed equipment, loss of production, or even loss of human life or environmental disasters. Using products from un-approved suppliers or trademark counterfeiters can result in product liability claims due to: equipment failure, loss of production and/or costly repairs or fishing jobs, and possibly structural and environmental catastrophes. Even worse is the prospect of worker injury should the inferior metals purchased from deceitful suppliers fail during use. These consequences of failure can be greatly compounded in environmentally sensitive areas such as offshore drilling. In today’s globalized supply chain environment, raw materials can be procured from any number of sources and due diligence is required to guarantee not only trademark ownership, but also the absence of conflict minerals. Subsequently, minerals can be melted almost anywhere in the world including numerous locations in new or developing economic regions and countries, where industrial and commercial trade practices may not meet recognized supply chain integrity standards. With unscrupulous counterfeiters tempting or deceiving companies with lower prices and availability of specialty alloys, how can you police the fair use of your trademarked products and the integrity of the brands? Quality suppliers want to ensure the safe use of their products, and maximize customer user experience. The next blog in this series will explore how manufacturers and customers can both protect trademarks and ensure that they are getting what they paid for from metal melt to finished product. Note: GDTM and SUPA® are trademarks of Central Wire Industries Ltd. Please click here for the news release in PDF format. Central Wire Industries UK had the opportunity to display under the CWI group of companies banner at Wire 2016. Previously known as Hempel Wire Ltd, CWI purchased the company in 2015 and was very excited to showcase their wide range of Stainless Steels / Nickel alloys / Non-Ferrous wires - spring wires, profiles, slicklines, ropes and cables. It was a huge event that brought together numerous industry professionals. Thank-you to all our international agents that were with us to assist in building new relationships and connecting with the visitors to our stand. Over the course of the five day show we met business experts and customers from all around the globe in industries such as nuclear, aerospace, medical, automotive and oil and gas sectors. Wire 2016 was the perfect time to launch our newest innovation, our mobile CWI APP. This new technology provides on-thego access to important information and services related to your business needs. With the 60 inch touch screen-feature available this allowed visitors to draw their desired profile/shape and submit the design to CWI. Guests visit the CWI booth at Wire 2016 With a great number of new connections and many more requests for information by mail, CWI is happy to report the success of Wire 2016. Keep a close eye on us for Wire Dusseldorf 2018, CWI plans on being the biggest, and best ever! 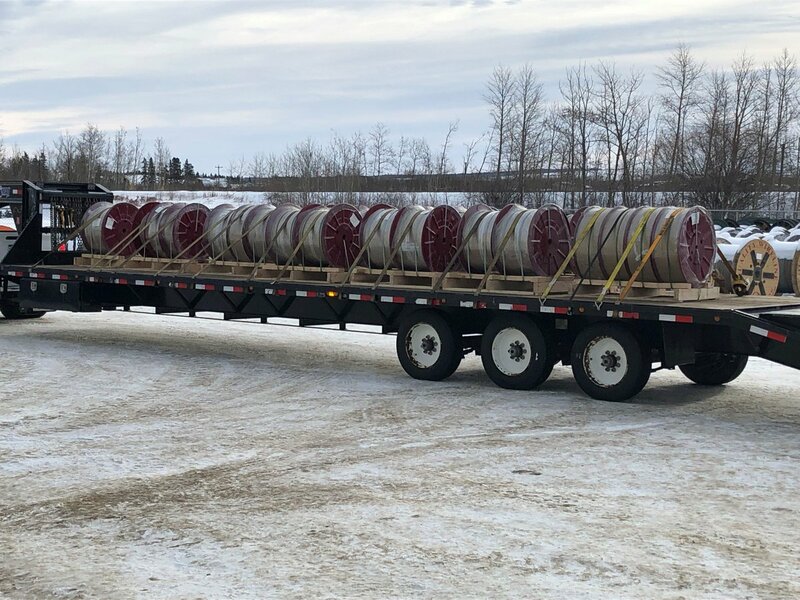 CWI's new Alberta facility in Lacombe, is making wire deliveries of all "shapes and sizes" for Western Canadian manufacturers and fabricators.